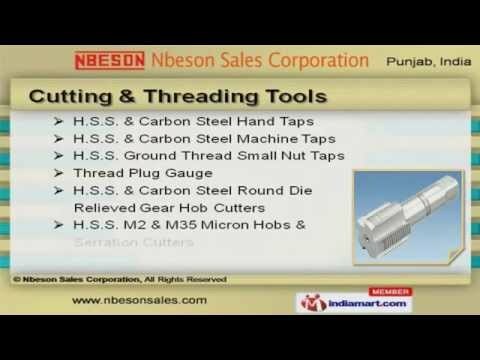 Welcome to Nbeson Sales Corporation Manufacturer of Cutting & Threading ToolsThe company was established in the year 1960, at Ludhiana. Our Innovative productionprocess help us to cater Indian Subcontinent, South & West Europe. Excellent logistic support, Timely delivery schedule & highly motivated employees helpus to achieve an unrivalled position in the industry. We offer a vast range of Industrial Fasteners, Cutting & Threading Tools. Our Cutting & Threading Tools are superior in performance. Industrial Fasteners offered by us are well known for their durability. Our Threading Machines are available at industry leading prices. We also provide Nut Threading Machines that are in huge demand across the globalmarkets. Along with that we offer Die Head Ranges that are nothing but the best solution for allyour needs.